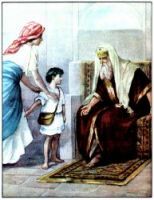 The First Book of Samuel begins before the birth of Samuel, with his mother, Hannah. Hannah has long been regarded by both Jewish and Christian commentators as typifying the Church of God yearning for the coming of the Messiah, enduring deep misery while looking forward to a period of beatitude. So Hannah yearned for the birth of a son. She was a childless woman, wife of Elkanah, a wealthy Ephraimite. 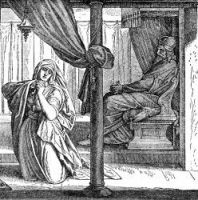 Hannah endured in silent sorrow under the worst curse that could befall a Hebrew woman. Hannah vowed that if she had a child, he would be devoted wholly to God's service. One day Hannah and her husband went to worship at the sanctuary of the ark at Shiloh. The high-priest, Eli, overheard her earnest prayers to God to give her a son. At first, Eli thought Hannah was drunk, and rebuked her, but when he discovered the truth, he bade her go in peace, saying: "And the God of Israel grant thee thy petition that thou hast asked of him." Such words from the chief priest seemed to Hannah to have the force of prophecy, and her sadness was lifted. 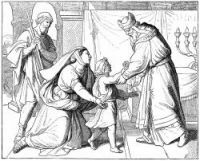 Just as she had anticipated, she had a son, whom she called Samuel. 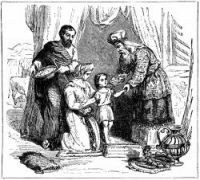 Hannah nurtured her son until the age of three; then, following her vow, she brought him to Shiloh and presented him to Eli, who accepted the child as a gift to the Lord. On this page you'll find nine Hannah Bible pictures taken from my collection of antique Bibles and story books. You're welcomed to use these Hannah Bible drawings in your art projects. Click on the Hannah Bible illustrations below to see more details about saving a free Hannah Bible image or about purchasing the images of Hannah from the Bible at a higher resolution.